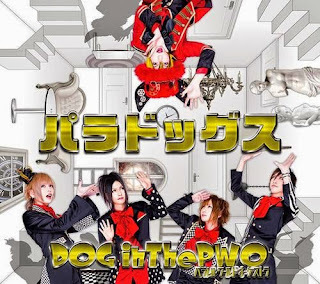 February 18th, DOG inThe PWO released their latest full album, “Paradogs.” Despite how great their last few singles have been, the full album was — by comparison — a letdown. “Paradogs” was released in three TYPES, but for this review I will be covering the tracks included on the TYPE A release. Overall the album contained 12 tracks, 5 of which had repeated songs from past singles. This left 7 tracks for the band to simply wow me. And I gotta say, their single releases were still some of the best tracks on the album. Now my biggest complaint for this album is the really strange openings that some of the songs had. They were completely misplaced. Below I have included a link for the PV of “Hallelujah”. From that, you will see what I mean by misplaced openings. You get a “Hallelujah” chorus leading into a rock song. While this concept is original, I wouldn’t say it helped the song. At the same time, don’t let it push you away from the rest of the track. Despite that misleading intro, “Hallelujah” itself is a very energetic and upbeat song that is fun to listen to. One reason I love DOG is because Vo. Haru still has an amazing voice despite how it’s often drowned out by the dog barks and auto-tune effects. The next two tracks on the album I could’ve done without, but that is because I have never really cared for autotune and those tracks go overboard with it. The next songs I want to talk about are “BABY Refrain” and “Stand by Me.” These songs seem to be too similar in how they’re laid out, and it probably has to do with the fact that Haru sings Engrish lines “I love you” or “Stand by me” leading into the chorus in both songs. They’re still sweet sounding songs, but it’s hard to get into the latter because you feel like you’ve already listened to it. Back to my original point of awkward intros is “Spooky Horror Show.” The album has all of these upbeat happy sounding songs and then suddenly… Scream, Tower of Terror then…. happy song! And more barking. Talk about out of place. There seemed to be no point to that intro. And if the lyrics are somewhat tied into that, then I’m sorry but songs usually sound better when the music style matches the message of the song. Of the new songs, “memento_mori” is probably my favorite. Sure, it’s a slow song but it’s the nicest change of pace on their album. You get to hear Haru’s voice without all the strange effects, making it a pleasant song to hear. I have to say I’m disappointed in the album. The band has a lot of potential and after those last singles, they could’ve done a lot more. The band still gets some great guitar solos in there, but the album effect was lacking. If it weren’t for some of those last single inclusions, the album would have been very weak.